Elegantly designed and complimentary to any décor and design, it is ideal for you to use in your bedroom, bathroom or dressing room. The Beauty Box organizers are not only limited to makeup products. 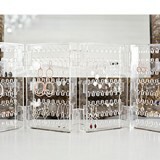 You can store your facial products, spa essentials, nail polishes or even your jewelry in any of the available designs. Gone are the days of digging through too many toiletry bags to find your things! Everything is neatly stored and easily accessible. The Beauty Box products are exclusively distributed in South Africa and are made from high quality Lucite Acrylic. Every Beauty Box has been individually constructed and finished with gorgeous glass crystal handles. The Beauty Box also offers a functional range of other accessories that compliment your organizer. These include lipstick, makeup brush and nail polish holders. The ideal storage solution for every woman!